Family friendly holiday accommodation and small group accomodation in the Tweed Heads, Byron Bay, Ballina, Gold Coast hinterland, Tamborine Mountain area of NSW and QLD, Australia. Family friendly resorts, special interest group accommodation. Family friendly accommodation and small group accomodation in the Tweed Heads, Byron Bay, Ballina region of NSW and Gold Coast hinterland QLD, Australia..
Hosanna offers a range of affordable accommodation options including comfortable cabins, "safari huts" to suit families, couples and singles, and a primitive camping ground. Family friendly and Small Group Accommodation includes holiday lodgings suitable for groups of 6 - 20 people. This accommodation may offer facilties and services suitable for children, like a playground and swimming pool, wet weather toys and games, and/or recreation or games room. Facilities include communal lounge, kitchen and dining area, laundry, internet access, and a wood fired sauna next to our swimming and kayaking dam. Kids can pet and feed the farm animals, and we're dog friendly (campground only). 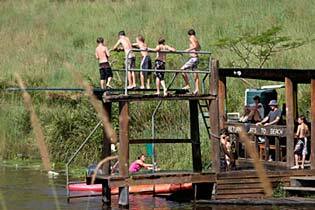 From AUD $12 pp camping to $160 pn for cabins Day visitors welcome - $. Alstonville Country Cottages feature wooden floors, high ceilings, kitchen, and a balcony with views of the rainforest and the ocean. Facilities include a swimming pool and BBQ area with a wood-fired pizza oven. Massage available by arrangement. Farm animals are always happy to be fed by guests. The Ballina Fun`n`Sun Motel is just 500 m from 'The Big Prawn' and features a saltwater outdoor pool, barbecue facilities and free Wi-Fi. All units are located on the ground floor with ample covered space located directly outside of each unit. A free airport shuttle service is available upon request. Mantra on Salt Beach provides rooms and suites in the heart of Salt Village on Kingscliff Beach, and features an outdoor lagoon-style swimming pool and heated rock pool and spa. All rooms have a balcony, some with ocean views. Facilities include a children's pool, tennis courts, an exercise room and barbecue area.